In an interview with Alex Jones recorded on August 26th, 2018...Roger Stone made the following comment regarding the death of John McCain. He emphasized that as Christians our wish is for the deceased to rest in peace...and the present moment is not the time to focus on criticisms of or differences with the late Senator. Stone and Jones were magnanimous and considerate in choosing to refrain from rendering commentary relative to the long history of McCain’s questionable and less than exemplary conduct. Clearly...they were going to great lengths to take the “high road” as it is often referred to. John McCain has been prominent on the national political stage for most of my adult life. His reputation has long been that of a supposed “political maverick” who was willing to buck the will of his own party in order to remain true to his conscience and convictions. In the superficial realm of political perceptions...McCain’s was a skillfully crafted image that was often exploited for the advancement of the globalist, anti-American agenda of the shadowy forces of the governing elite. In many respects...he was the classic embodiment of the phenomenon whereby artificial, false heroes are engendered and concocted for extensive instances and patterns of sophisticated manipulation of the population and electorate of the nation. During the Vietnam War, John McCain became a prisoner of the Viet Cong and was reportedly subjected to harsh treatment and torture. Unknown to many ill-informed observers is the fact that McCain was the son of a Navy admiral who was also the son of a Navy admiral. There are a great many charges and accusations to the effect that McCain received “special treatment” at the hands of his wartime captors...given his unique status as both a son and grandson of high ranking Navy brass. It is also commonly asserted by various of his military contemporaries that McCain betrayed his fellow POWs and was known to “sing like a canary” at the hands of those who held him in a state of captivity. Needless to say, these unflattering portrayals were overwhelmingly ignored by the controlled media, who instead, consistently sought to prop up and foster the heroic profile and public perception of the Arizona senator. In the late 1980’s John McCain was swept up in a payola scandal that became known as the Keating Five. Along with four Democratic senators, McCain was implicated in an unsavory affair that involved bribery, payoffs, and severe financial losses suffered by 23,000 bondholders of the Lincoln Savings and Loan Association. McCain and his fellow implicated Senators were alleged to have inappropriately intervened on behalf of financial tycoon Charles H. Keating, Jr. in 1987. Of great significance was the fact that Keating had been a major financial contributor to the five tarnished U.S. senators. 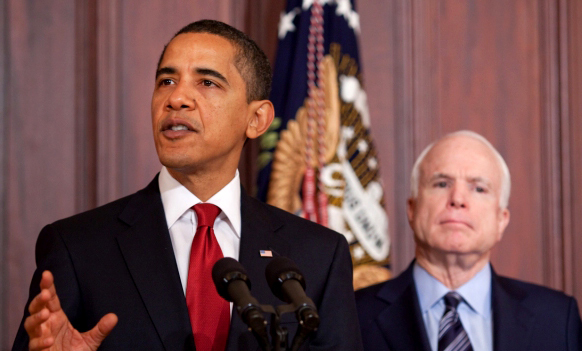 McCain managed to finesse his way through the scandal...in large part due to the fact that the controlled national media chose to ultimately “let him off the hook.” John McCain was forever after the establishment’s reliable front man...always willing to assume the role or posture that best served the ongoing globalist agenda. By 2008 John McCain was far enough removed from his late 80’s infamy to secure the Republican nomination for the presidential race. His opponent in the general election was none other than the hand-picked agent for radical and revolutionary change...Barak Hussein Obama. Very early on, it became quite obvious that McCain’s scripted role in the ’08 election was to maintain a low key, hands off approach in his campaign against the little known, hyped up black junior Senator from Illinois. Indeed...McCain was very much akin to the co-opted prize fighter who takes a dive and throws the match with a scripted outcome. Obama went on to win the election and subject the nation to eight years of horrific subversive executive policies and leadership...a devastation from which no antidote or recovery could ever be realized. Over the decades of his political career, John McCain carved out the dubious distinction of being one of the staunchest proponents of devastatingly expensive military adventurism and grossly unconstitutional policies of regime change. Simultaneously, he also emerged as a powerful ally of and advocate for those pushing a protracted agenda of amnesty and undeserved citizenship for countless millions of illegal aliens. In these two vital areas of concern...McCain did as much as any political figure to lead the nation to the brink of insolvency and destruction. 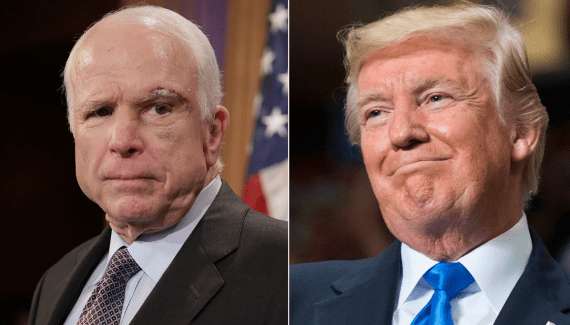 With the advent of the Trump phenomenon and ascendancy, Senator John McCain became one of the most prominent point men of the deranged and desperate anti-Trump coalition. Virtually until his dying breath, he maintained an irrational, venomous antipathy toward the man who dared to gore multiple sacred cows on his march to the oval office and beyond. In this...the final act of his sordid political career of sellout and betrayal...McCain earned the undying reverence and admiration of the vast cadre of leftist, socialist, globalist traitors who have consecrated their all out devotion to the cause of thwarting Trump’s determined efforts to bring about restoration and revitalization in an otherwise dying, once great republic. Like countless others who have prostituted their intellect and talents...John McCain appears to have made that Faustian pact with the devil that could very well now be proving to cost him his immortal soul. Of course, only God knows and determines the eternal destiny of mankind...but from the studied and objective vantage point of a mere mortal observer...I wouldn’t want to be John McCain right about now. Fascinating history lesson! McCain remained to the last, (at least as far as we know) an unrepentant traitor to his country and his people. He has gone on to his eternal reward. It strikes me as a great idea to award this year's Noble Peace Prize to McCain's brain tumor. After all, if a POS like Prez Obamanation can get one, why can't a brain tumor? 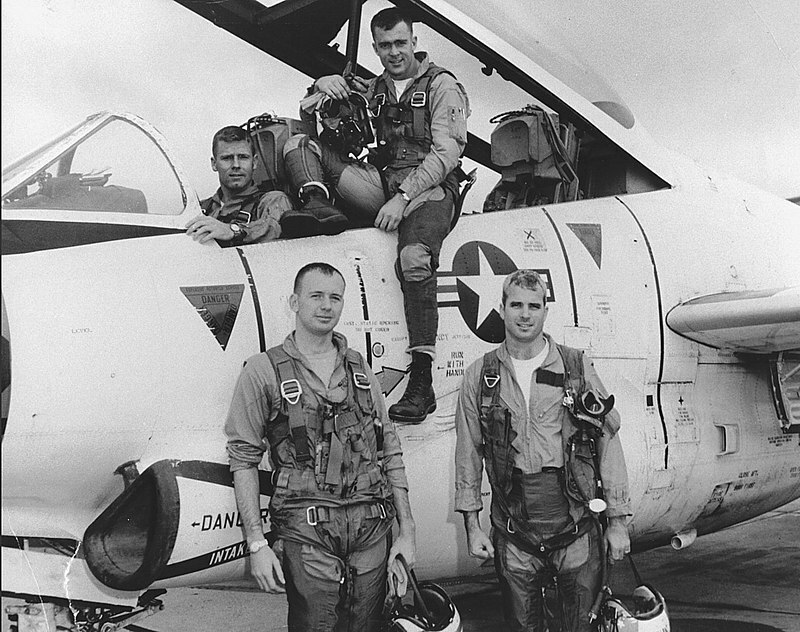 McCain is well named since he has caused the death of many of his "brethren" both on the USS Forrestal, where he was known as "Johnny Wet Spot" and in Vietnam, where he was known as "Song Bird". No need to remind people that he personally hindered any investigation into the missing POWs or his involvement in the "Keating 5" scam, is there? People say that "the good die young" and McCain's living almost 84 years proves the saying is true, doesn't it? It seems that he didn't repent before he died, so I'm sure he will have an especially hot spot in Hell awaiting him. John McCain was no hero. John McCain represented the worst aspects of the globalist agenda. That he was indeed a Socialist-Democrat is without a doubt. I served two tours in VietNam and had the chance to meet many heroes, real heroes. Two in particular were taken captive by the VietCong, and after their release they didn't think they were heroes. In fact, they consider themselves failures in life. 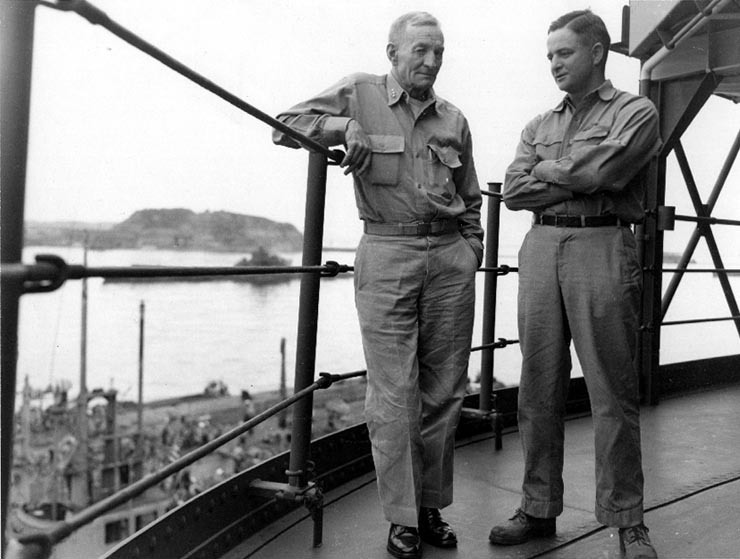 They never sought to parlay their POW status for a powerful "Maverick" position. They never sought to portray themselves as anything but born losers. One, ended taking his own life, the other ended his life being institutionalized. McCain was for McCain and never for the people of Arizona. Only a worthless, narcissistic, piece of bovine excrement would write his own funeral, and only a mentally handicapped on the portal of death would refuse to resign for the sake of the people of AZ. The last thing this backward, sub-normal "Maverick" did was to try to force the Governor of AZ to appoint his wife Cindy to his spot in the Senate. As if that spot belonged to him and not to WE THE PEOPLE. The day this Benedict* Arnold died I celebrated. Now we need to flip the seat back to a conservative-minded patriot.